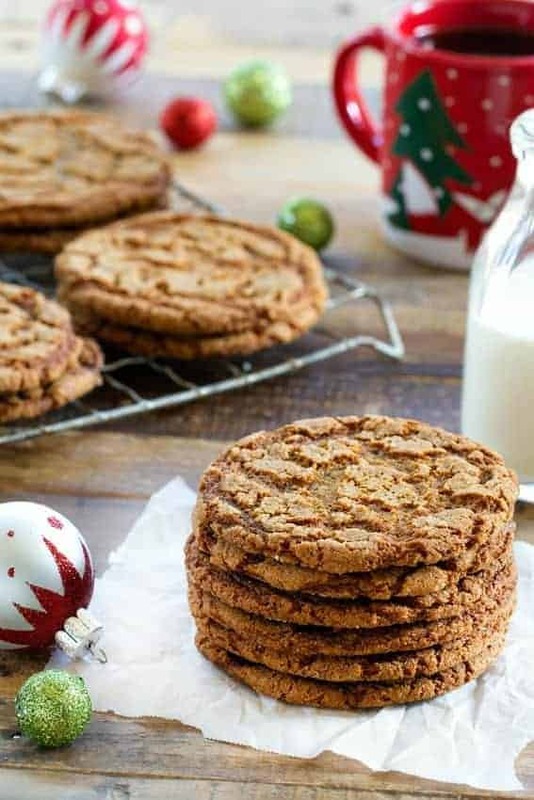 Crispy Ginger Cookies are a dream holiday cookie. Every bite of crunch, crispy, delectable ginger flavor will having you wanting more. This is a sponsored post on behalf of Challenge Butter. All opinions are my own. Thank you for continuing to support the brands that make My Baking Addiction possible. My husband has an obsession with store-bought cookies. The thinner and crispier, the better. Needless to say, it can sometimes be a little blow to this baker’s ego when he’ll gladly pass up a pan of freshly baked cookies for their pre-packaged counterpart. I’ve spent countless hours trying to perfect a homemade version of his favorite chocolate chip cookies. Doing research, making copycat recipes that I found online… and they’re just never the same. I decided to accept the fact that replicating his beloved chocolate chip cookies at home just isn’t going to happen, so I though I’d give his holiday favorite a try – Crispy Ginger Cookies. I used Challenge Butter to whip them up. If you’ve never tried Challenge Butter – you most definitely should. It’s made with 100% real cream, so there is nothing artificial about it. And it’s made from cows not treated with the Growth Hormone rbST. It’s our favorite butter to bake with. Let me tell you – I feel like I won some kind of award. Eric (and Elle, and my dad) loved these cookies. Like, devoured them to the point where I had to intervene so I’d have some to photograph. They have perfectly crispy edges, with just the tiniest bit of chew in the center. 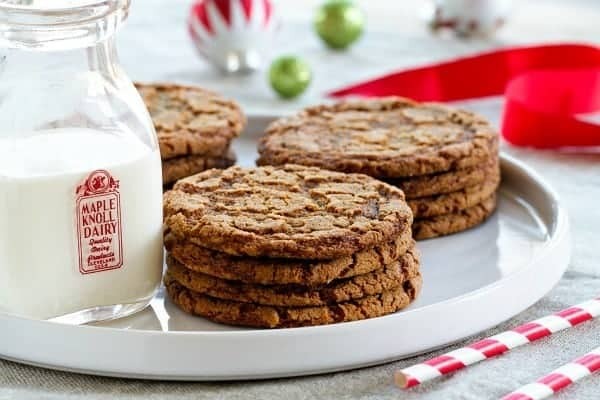 There’s definitely a ginger kick, exactly what you want in this kind of holiday cookie. I hope you’ll skip the store-bought gingersnaps and try these on for size. They’re SO good! These look so delicious and evenly baked. This is what i struggle with. What is the secret? Is it the medium heated oven and a bit of patience or is it something else. Mine usually get overcooked. Thanks in advance. Hi, Shirley! I’m sorry about the overcooked cookies. Do you have a thermometer in your oven? Maybe your oven is uneven or too hot. Let me know if I can help further. Take care! 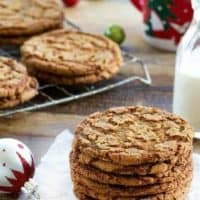 Hi – I really like totally crunchy cookies, no chewy center, just crunch crunch all the way … do you know what cookie sandwich filling recipe I could use that won’t add any moisture so that evens days later the outside cookie shells remain just as crunchy as first baked, please? Thanks :) P.S. Shockingly impressed how thin and even your ginger cookies look … envious! Hi, David! I’m not sure exactly what you’re looking for, but you could give my Gingerbread Sandwich Cookies with Cinnamon Cream Cheese Filling a try. Let me know how it goes! Hi …the biscuit barrel is empty..I can’t have a cuppa without munching.. hubby’s face looked like he lost his best friend, so had to make a plan!! Found it!! Thank you so much for a great recipe.. almost perfect..mine more raised at top but taste is great…God bless. Thank you so much, Brenda! I hope your husband enjoys them! Thank you so much for a crispy gingersnap recipe. They are so hard to find,I don’t know why. Can this recipe be doubled and if so are there any other adjustments needed other than doubling everything? Thank you for a response. Hi, Renee! This recipe can definitely be doubled, and I don’t think any extra adjustments are necessary. I hope you enjoy the cookies! Can I use Land o Lakes margarine in lace of the butter? I’ts 80@ vegtable oil. Hi, Renee! I think you can probably use margarine, but the texture may turn out differently. Let me know how it goes! Hi Jamie, can I use something instead of mollases and just butter, not Challenge butter? Hi, Beka! Try substituting honey for the molasses. I’ve never tried it, but I think it should be fine. And regular butter should work well. I hope you enjoy them! Love this recipe! Thank you so much for sharing!!! I added a teaspoon of salt. They’re a real crowd pleaser!! I’m so glad you liked them, Taylor! They’re popular in my house as well! It’s in the oven now. Smells amazing. I rolled the dough into a sheet tray to bake. Then plan to blitz and use as a base for cheesecake! Tis the season for baking! I hope you loved them, Kathy! Happy Holidays to you and yours! These are the bomb! So simple and absolutely delicious. I added more ginger [just because I like it] and topped with slivers of candied ginger before baking. Crispy with a perfect hint of chewy ginger at the center. I baked between 12-13 minutes and doubled the recipie. LOVE! So happy to hear you enjoyed them, Phyllis! Thanks for stopping by and leaving your feedback! mhhh……am just salivating looking at the ginger biscuits,am just imagining myself with a warm cup of milk an d the ginger in a plate. Mine puff up but dont go down..what am i doing wrong? Hello! I’m not sure what’s going on. They typically puff up and then deflate and end up how they look in the photos. Sorry I am not more of a help. Love your story. I am a Gingersnap person too. So happy to hear you enjoyed the cookies, Cheri! Thanks so much for stopping by and leaving your feedback!